I've chosen! Thank you Brittainia Library. I'm excited about this, it has been on my reading list for a long, long time. I think I'll start it in bed tonight, which is where I should be going very soon as I am full of wine and pie. 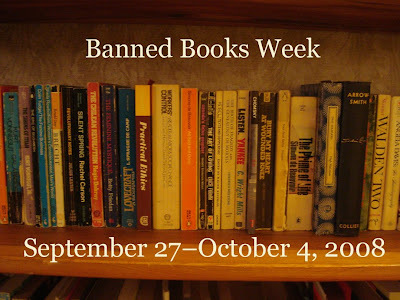 A quick update on the Banned Books week reading, I've found another list from the OCLC (Online Computer Library Center) that is more universal, and also less 'teen literature' focused for those of you who perhaps want something a little meatier. You can find this new list, here. I was thinking I'm going to chose 'Of Mice and Men' as it is one I've been meaning to read for awhile now, but of course all the copies in Vancouver are checked out it seems! 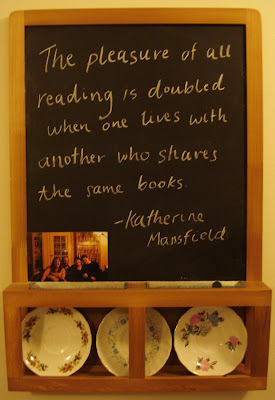 We may have it at home, which would have been one reason to put our books into some kind of order on our bookcase because now it could be a bit of a mission to find it! A man with a gun in his hands. To Kill A Mockingbird is one of my all time favourite books. I first read it for school, and then somehow figured out a way to read it the next two years (for school) also. I still read it and love it again, and again. The way Harper Lee has captured the attitudes of the south, her portrayal of Atticus Finch and his beautiful gentleness and seemingly unwavering morality. And Scout, oh what a character. What a perfect way to show us how things ought to be seen. It's Banned Books Week starting this Saturday, and somehow this book is still in the Top 100 Most Challenged Books for 2000-2007. Still! 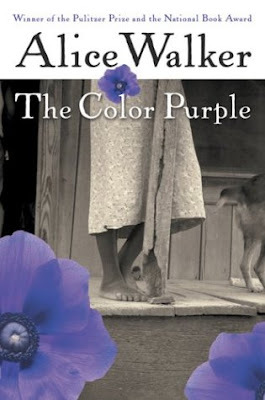 It's way up at 23rd in fact, surrounded by such classics as Of Mice and Men, The Colour Purple, Catcher in the Rye (!! ), The Adventures of Huckleberry Finn and almost all Judy Blume books. So, here is what I'm going to do. I am going to chose a book from the above list, that I haven't yet read, check it out from the library and start reading it this Saturday. I would love you to join me! I'll announce which book I've chosen before the weekend, so feel free to leave me a comment with the book you've chosen. 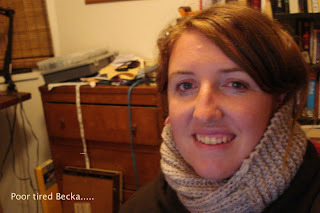 Once we're finished we can either blog about it (please let me know when you do!) or if you don't blog you could always email me your 'review' and I can post it on here. Even though this is technically an American thing, a) we all know the influence this country has over popular culture, and b) we should be promoting freedom of speech, anywhere. It was my second cookbook night last Thursday, and I was a little more prepared this time. I decided on the 'Bombay Roll Up' (hence the corny name) from the Rebar cookbook. Rebar is an apparently fantastic veggie restaurant in Victoria, which I've never actually been to as it was closed the one time I was there. So when I saw their cookbook, barely used for $7 at Bibliophile awhile back I snapped it up. This is actually the first thing I've made from it, but everything looks amazing. I especially like that there is a section all about basics such as pastries, stocks, tortillas, chutneys, etc. At first glance their recipes seem a little daunting, but I was pleasantly surprised at how simple this was! 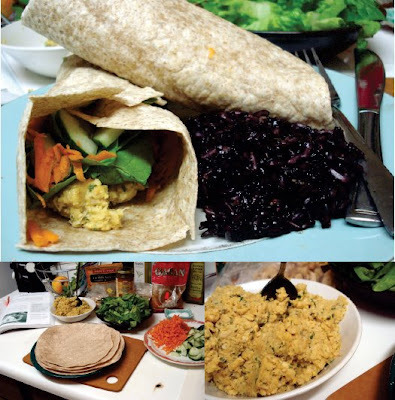 Simple and delicious, basically just warm tortillas (or chapati) filled with fresh veggies and a to die for hummus. The hummus was easily my favourite part, especially as it has cilantro, cashews, and coriander in it. It also calls for mint, which is not usually my favourite (except of course for mint coconut Crispy Cats, swoon) but it really made it good. If anyone wants the hummus recipe, drop me a line and I'll send it through! 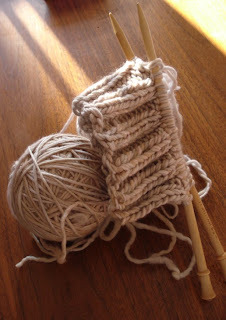 Right, now I'm off to rip out my latest knitting project and start over. They're mittens, but apparently for giants hands so I might need to cast on a little fewer. Another alone day at work, and of course this leads to various blog following....and wishing this wasn't my job. Of course, there are aspects of working at the gallery that are good. I get to be surrounded by amazing art all day, and stare at the giant Riopelle mosaic we have on our wall. I get paid pretty decent, and obviously have a lot of free time on certain days! In my free time, I've been browsing the Women's Workplace Wednesdays flickr group, and seeing all these amazing studios (especially Camila Engman's studio, swoon) and spaces where women get to work from home, be creative, enjoy what they're doing, and have cool desks. I know its not all about that, and that maybe not all these women are happy with their jobs - so really I am being a little facetious, but the thing is that some of them are doing exactly those things. And surely, so can I. Here is the thing. The thing is this....well. Ideally, I want to doula and create. I want to be at home when Richard is at home (our schedules are almost opposite at the moment) and chat, and create, and hang out. I want to have the free time to become involved in my community, because heaven knows my community in particular needs people to become invested in it. Hmmm. This was not at all supposed to sound like I'm whingeing. Because, really the fact is that I've been inspired by so many people who have chosen to work, or really live, in a way they feel is authentic. Authenticity, huh Kate? It's what we come back to, every time. So I bought this book recently, and I'm loving it ( I also love their blog too, which is more than worth a look). 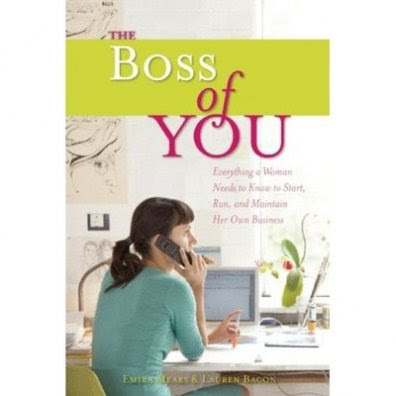 I'm loving the fact that it is not at all your classic business-y book, and that they're not all about making money and nice guys finish last, etc. And (never start a sentence with and, I know) they're women. Brill. I'm gonna do it! I'll still nanny (because I love them, and I love that they give me money for playing). I'm going to make Keep Cozies, get involved in the community garden, make from scratch more, support women, love my neighbours, drink tea, sleep in, advocate and resist the repression of the DTES, and sit in the sun. Not in an office with literally no windows. The other thing is, I realise and want to make a point of noting, that I am in a pretty privileged position to even be able to contemplate this move. We are by no means wealthy, but we're comfortable and I have a stable, supportive husband. I also have a very supportive family. I am completely aware that this is not a reality for a lot of people, and that not only do they not have the support of their families, they also do not have the support of their communities or society. 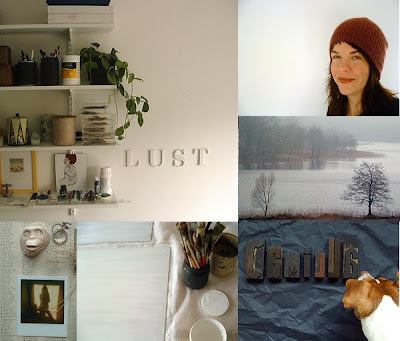 Obviously, having a beautiful craft blog, working from home or being able to create the perfect studio space is not the be all and end all - but having the chance to live a fulfilling and authentic life you love, is. It is so important to me, that people get to experience this freedom, so all the more reason for me to do so myself. And change the system I guess (crazy communist/anarchist/feminist/socialist/'insert leftist label here' that I am). On a side (but related note), my lovely friend Julie and I have completed our website for our doula business, Blossoming Bellies. You should all check it out, and thank you THANK YOU to our lovely husbands for doing so much of the hard work for us (art work and website making). Bring on the mamas! 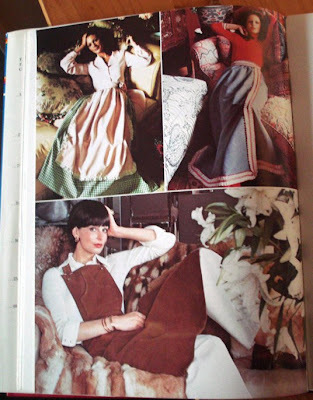 There is actually a lot of really good patterns and ideas in both the books, although I'm not sure that I'll make a full on bedspread. I would, however, love to make these/be these glamorous women. I love that not only are their aprons wonderfully long, but that you also get to recline while wearing them instead of cook or get messy. The 70's must have been a wonderful time. Another recent alleyway present was this little treat. Apparently he found it near our house on his way home from somewhere, so grabbed it and re-strung it for me! 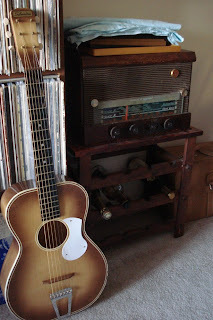 I left my acoustic at home when I left NZ, so Im excited to have one to play now. Plus, its pretty darn cute and rather old from what we can tell. Lucky me. In other news, for quite some time now Richard and I have been talking about making better use of our growing cook book collection. 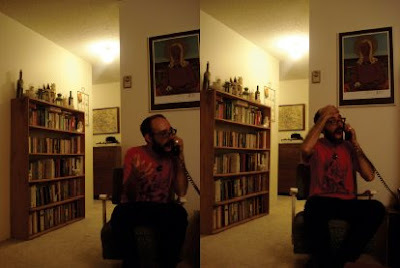 Our schedule isn't very conducive to hang-out time, as I get home around 7 most nights and then he leaves for his night shift by 9 (sigh), so it's usually a quick dinner and chat before he's out the door. What we've decided to do is, each one of us has a designated night of the week to make a new (one neither of us has tried before) recipe from one of our cookbooks. That way, we get to eat a nice meal together and we also make sure we're cooking up something other than our 'go t0' recipes twice a week. I also just like food, so it's perfect really. 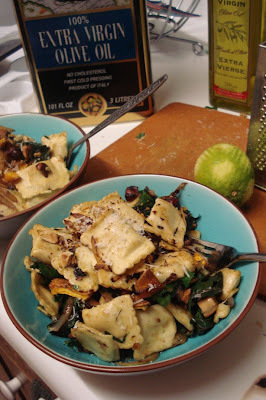 It was my turn first, so last night I whipped up the above Hazelnut & Chard Ravioli Salad from 101 Cookbooks. I know it technically isn't one of our cookbooks, but I do use it quite often and of course I hadn't planned ahead far enough so looked this up at work and got the fixings for it on the way home. I must say, it was bloody good. Really easy, but tastes fancy (my favourite kind of recipe) and although I didn't really have time to make the croutons like Heidi says, I just popped the squash cubes in the oven and roasted them while I did everything else - which worked really well! I think you should all try making this, the lemon (even though I used lime...) totally makes it - Yum. 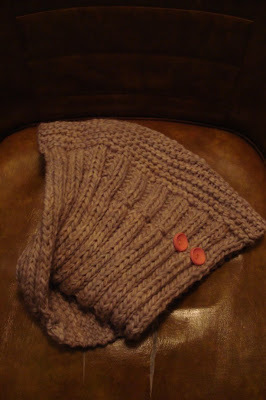 My first for sale Keep Cozy is finished! Im super tired, but couldn't leave this unfinished/have been up late talking to Kate. This won't be going on etsy though, that is to come. I was recently asked to sell this in a for real store, one that I love, here in Vancouver. So this is the start of my first batch. Hooray! And this is tired me, modelling, in a messy, not yet studio glamorous den. G'night! I sure wish I could yodel. Today was a lovely mellow day. Sleeping in, hanging out and chatting with Richard, lunch on The Drive at little nest, chatting about consignment possibilities with Heather at Lucky Rooster (love), thrifting and a walk home past Casa Gelato aka my dream world. I even got to wear my new etsy purchase from the wonderful Rhiannon at Toast Clothing. I love, love it. So perfect for a sunny day, comfy and comes with a little piece of home (that's a fantail on the hip!). Make sure you check out her store and blog, so good. Tonight was especially exciting, as we were able to make our first dish using veggies from our garden. Hoorah! Well, technically we have used the basil, but I don't think that quite counts like this does. When I got home from our trip out, I noticed that our rainbow chard had totally wilted in the sun and I think it was also just getting a little big. So I gave it a big drink and decided to harvest some of it tonight. It was delicious! 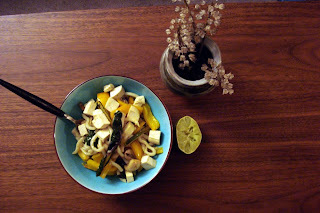 I made a lime coriander noodle dish with tofu (when I say dish, really I just made it up) and it was simple and lovely. Just saute some mushrooms and capsicum (bell pepper) in olive oil and garlic for awhile, throw in your chard and continue to saute for another 5 min or so. I then covered the pan to let it all steam together for a few minutes. Thoroughly squeeze half or a whole lime over the veggies and add coriander depending on how strong a flavour you like. Add enough noodles for the desired end amount and saute for 5-10 min. Throw in some tofu and heat through so all the flavours and goodness mix together. Voila! Haha, not so exact I know, but it is very simple. I'll write down the recipe next time I make it. I'll leave you with this, my accompaniment for the evening. Today's Flight of the Conchords moment. I was on the bus knitting while trying to balance myself in the bendy bit (the new bendy buses don't have seats in the bendy bit, just a place to rest your back) and noticed this guy completely intrigued with what I was doing, so I smiled politely ('cause really he was just staring and I didn't know what else to do). Bus guy: 'A nick...a what?" Bus guy: 'What's a nickwarmer?" Me: 'Ha, yep. It's the accent' (apologetic laugh). Awkward silence until we get to our stop. This is just a quick one, as I am really really meant to be tidying our house as we speak. We have both been sick in the last little while, with Richard only just returning to work tonight after 2 weeks off, so I am sure you can imagine what a treat our house is at the moment. But. I wanted to share these with you. 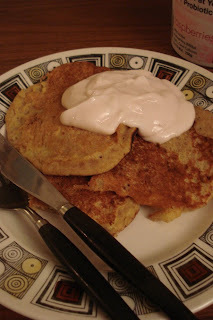 Neither of us felt that much like cooking this evening, so I decided on banana pancakes. 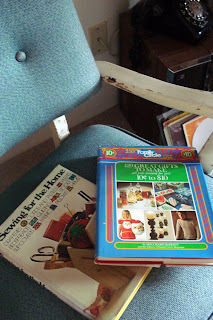 And yes we did eat them on the coffee table (the dining room table is covered with my latest thrift store finds, but more about that later). They were delicious, moist and just the right texture. You know, a few crispy bits on the outside, hot and a little runny from the banana on the inside. You too can make these treats! 1. Combine dry ingredients in one bowl. Mix together wet ingredients in another (make sure you beat the egg first). 2. Stir two mixtures together, don't worry about the lumps. 3. Lightly oil your skillet and heat it over a medium-high heat. Pour or scoop around about 1/4 cup of batter onto the griddle for each pancake. Cook until golden brown (your first flip will be when you see bubbles on the top of the batter) on each side. 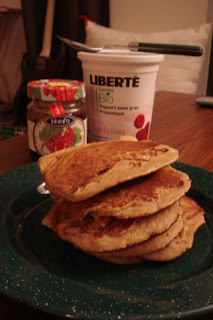 Of course, these are easily made vegan just by using an egg substitute (which we sadly didn't have). Time to tidy. Enjoy your day!